Shrimpy allows the connection of an unlimited number of exchange API keys. This means for every exchange we support, you can have any number of exchange accounts linked to Shrimpy. Whether you have 10 Binance accounts or 1 of every exchange we support, Shrimpy works for your needs. In the above screenshot, you can see that operating multiple exchanges is as easy as inputing additional API keys. 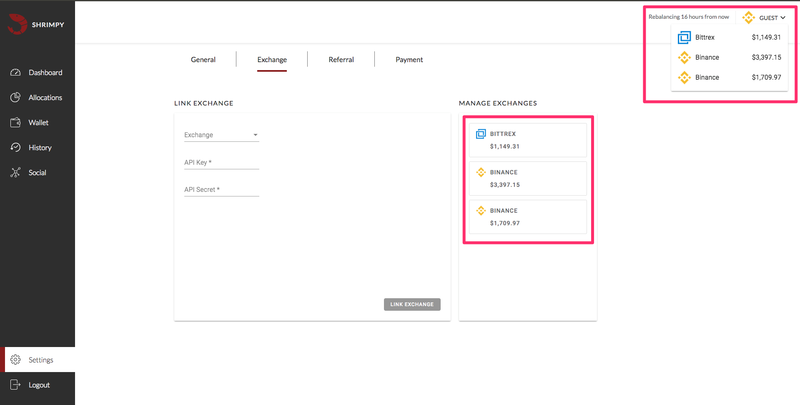 Once they are input, each exchange can be managed or removed from "Settings" -> "Exchange" -> "MANAGE EXCHANGES". In addition, you can click the icon in the upper right corner at any time to toggle between your different exchanges. This changes all of the tabs in the left navigation bar to be specific to that exchange you have selected. So, selecting assets, adding wallets, and using social on each exchange is as simple as toggling between each exchange. Note: Settings is a global tab. This tab applies to all exchange accounts and does not change when you toggle between exchanges.